In my recent explorations of the cyber-realm, I came across this most-interesting diagram. Having recently been re-working and expanding upon my own narrative concerning the Eightfold Model of Consciousness… this diagram, and its associated article, entitled: UNUS DEUS: THE EIGHTFOLD KEY TO THELEMIC MAGICK …caught my eye. As such, I found the synchronistic timing of “happening upon” this little diagram, when I did… to be more than a coincidence. 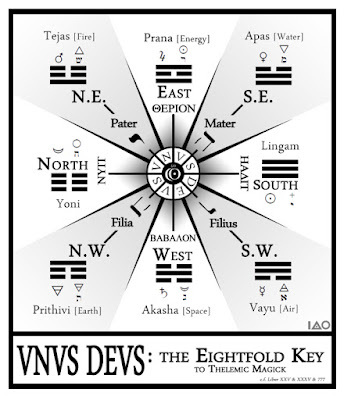 As mentioned earlier, I have been working on a project that explores what I refer to as the “Law of Eights.” Seemingly divergent disciplines such as philosophy, mathematics and music demonstrate similarity in their eightfold organization. Consequently, in studying the Law of Eights, an overarching synchronistic principle arose, as if of its own accord. More on this, in future posts. Whenever examples of synchronicity bubble up to the surface from the unconsciousness, it is advisable to take notice. However, it is not always initially clear exactly what these synchronous events point to. As readers of this blog know, synchronicity is not subject to the temporal laws of space/time, per se… but is rather atemporal... influenced or affected by meaning. The beauty of synchronicity is that like-minded individuals, regardless of proximity, often co-experience, appreciate and share in the unfolding of meaning, within the synchronous event. These “cosmic triggers” often require multiple user’s attention, to more fully interpret the event. Different individuals may hold different pieces of the puzzle, as it were. It is in the spirit of synchronicity that I present this diagram. Consider it and this post an invitation to partake in synchronicity. It caught my attention, for reasons that are not altogether clear... perhaps it will tickle your synchronicity receptors, as well. I am sure that many of you hold unique pieces to this puzzle. If this post sparks the experience of synchronicity, or otherwise acts as a cosmic trigger… please let me know in the comments section.